Anyone that has worked with me knows that I paired children's literature selections with therapy lessons as often as possible. When I left my last school for an office, I gave away hundreds of books and still have shelves full of children's books. Today I am featuring a site that I would have loved to have had as a resource when working in schools! 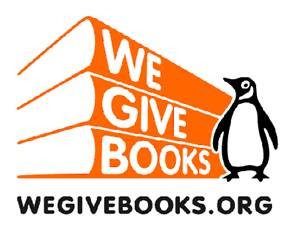 We Give Books, created by the Penguin Group and the Pearson Foundation, is a digital initiative that puts free books in the hands of children by allowing them to read the books on the Internet. We Give Books is a fabulous FREE resource for SLPs. The books can be projected on to a large screen or whiteboard for group sessions. Use your laptop for smaller sessions. Editor's Picks can be read on mobile devices. If your students have Internet at home, suggest a book to practice a skill. There are hundreds of fiction and nonfiction books available to read for students from birth to age 10. And, check out the Resources for Educators. I like the Reading Guides. They are just perfect for SLPs. I hope that more are added! Like We Give Books on Facebook for updates and more. You will love the We Give Books Pinterest boards where you will see over 400 books classified by subject area. One important fact that I forgot to add is that for each book you read, a book is donated. We Give Books donates to some of the world's best literacy organizations and right now is donating 5,000 books to Oklahoma schools affected by the recent disaster. Two more books will be added for every $5.00 donated before June 30, 2013. If you would like to contribute, click here.